It is amazing how new concepts are shaping the today and future of the fast progressing world we are living in. 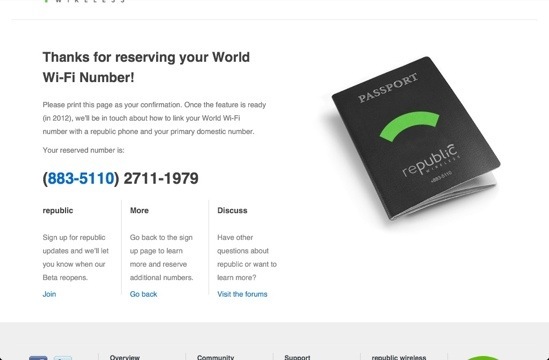 After bringing a revolutionary idea of bringing VoIP to cellphones today I received an email from Republic Wireless to get hold of a free international number. 1) All my friends and family can call me for a very cheap price as Republic Wireless has offered all carriers in the world a very cheap way to pass their traffic directly to them instead of paying heavy fees to other carriers to route the call internationally. 2) I frequently go back to India to meet family and for business. While I am there the same Republic Wireless phone with the world Wi-Fi number will work anywhere where there is a wifi. India is very advanced now, even in my village (Mohtli) there are many wifi networks available. This empowers all my clients, office, friends in USA reach me directly without a need of international calling enabled on their phone. Now I am waiting for 2012 when they will make this number available and functional. Once the feature is ready Republic Wireless will be back in touch and will let me know how to link the World Wi-Fi number with the Republic phone and my primary domestic number. I am excited to use this new feature and technology and wish the very best to Republic Wireless.